There is a misconception out there that states that a married couple must file a joint bankruptcy case. This is simply not the case at all. It is true that the total family budget is a factor in determining whether a bankruptcy case can be filed and of which chapter. However, there is no requirement that each party files a joint case. In fact, in many circumstances it makes perfect sense for only one spouse to file for bankruptcy relief. To cite one example of a couple that I met with recently who sought my legal advice concerning chapter 13 bankruptcy: The couple had approximately $125,000 worth of credit card debt. Of that total, only $14,000 of it could be applied towards the husband. The couple also had some form of marital assets in the way of available stocks and money on account in a checking account. After looking at their total financial situation as well as their assets and debt scenario, I made the determination that an individual chapter 13 filing by the wife would be the most appropriate scenario. After all, it made sense to keep the husband’s credit solid and not drag him into the chapter 13 bankruptcy when he only had $14,000 worth of credit card debt. The couple can actually utilize some of their non-exempt assets to be applied towards his credit card debt. This will effectively lower the liquidation analysis and likely lower the percent which needs to be paid back to the unsecured creditors in the wife’s chapter 13 bankruptcy case. The wife also asked me at the meeting what were some mistakes to avoid so that she doesn’t fall into the same trap as others before her. I advised her that if she’s going to file a chapter 13 bankruptcy case in the near future that she should stop making minimum monthly payments on her credit cards. She was spending over $1100 per month just on minimum payments. Since these creditors are going to be part of the chapter 13 bankruptcy case and be subject to the reorganization at a percentage of what is owed, it makes no sense for the debtor to continue to make these payments prepetition. I also cautioned her that using the credit cards prior to filing could be determined to be fraud and if so those charges might have to be paid back in full through the chapter 13. Although we must figure the non-filing spouse’s income when determining what the total family budget is, there is no mandate that both parties file bankruptcy together. As the above example illustrates, the right thing to do is to have the wife file individually. That way, a couple can preserve the non-filing spouse’s good credit rating and possibly apply some non-exempt assets towards the repayment of his obligations. 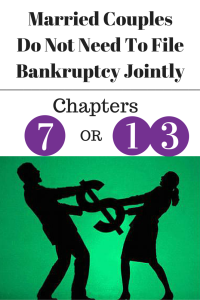 As long as the couple is putting all of their family disposable income towards the chapter 13 repayment plan, the debtor(s) have satisfied their obligation under the bankruptcy code. 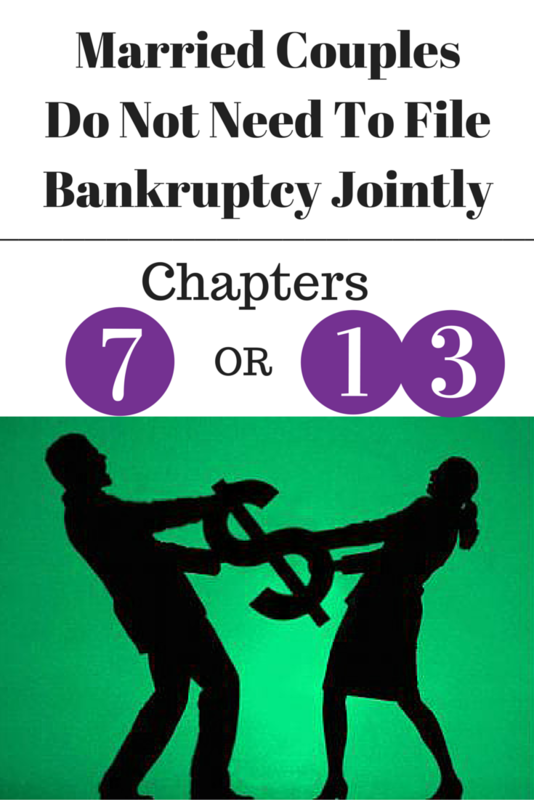 Keep in mind that chapter 13 bankruptcy is complicated. Do not even think about filing a chapter 13 case on your own. I received numerous calls each week from pro se debtors who now need help. Unfortunately, the best help that I can often give is a refiling. I probably could’ve avoided the first filing for them if they would’ve come to talk to me first. If you are struggling with credit card debt and you are only able to make the minimum payments, I strongly suggest you look into different forms of bankruptcy to determine what type of relief you can obtain. If you have very little in the way of assets, then a chapter 7 fresh start bankruptcy may be a good option. If, on the other hand, you do have assets which are non-exempt, then chapter 13 may be your best option. You can contact my office directly at 847-520-8100 to set up an initial consultation to discuss your personal situation. The consultation is always confidential and the advice can be life changing.